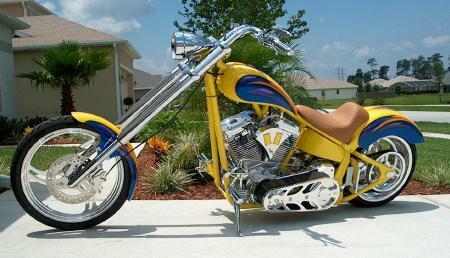 The frame is a Daytec (looks like Rolling Thunder Buil it!) with 4" up and 2 out... Fat Tubes... Nice Piece! We got a T.P 107" Polished Motor with a matching 5 speed T.P. Trans... We had to send the Spyke front end back for 2 more inches of length to get the Geometry right... We Chose the BDL, Top Fuel 2000 Open Belt Drive... This thing is a monster!!! 3 5/8" Belt with Funny Car Teeth on it, The biggest clutch I have ever seen on a Harley, Outside Bearing Support, and it looks Great!!! Cyril Huze Supplied the Art-Deco Air Cleaner and Coil Cover, Ness the Headlight, Jaybrake made the controls for the feet, while Eurocomponents got us the OMP Hand Controls and Mirrors. We had to be careful drilling out the holes for the wiring, but the powder-coat held up for us. 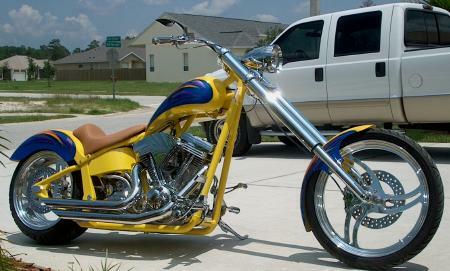 Todd Fisher laid down some beautiful graphics right over the Yellow, and grafted some cool L.E.D.s into the rear fender. Watch for the baby on the road as he passes you!! !